MuseScore allows you to enter music notation from any of four input devices: computer keyboard, mouse, MIDI keyboard, or virtual piano keyboard. The default input mode is step-time, in which notes or rests are entered one at a time. However, other input modes are also available. This section introduces you to the basics of entering notes and rests in step-time from a computer keyboard. It is also recommended that you work through the tutorial, "Getting Started: An introduction to note entry in MuseScore". This is available from the Start Center. 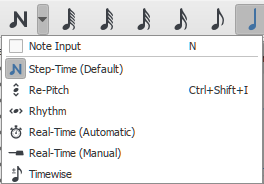 Select a starting position for note input by clicking on a note or rest, or selecting a measure, with the mouse. If you don't select a starting point, the cursor automatically defaults to the beginning of the score when you enter Note Input mode ("Step 2" below). Click on the "N" icon (on the extreme left of the Note Input toolbar). Press N on your computer keyboard. Click on the toolbar "N" button. Note: Double, triple and quadruple dots are applied from the duration toolbar in the advanced workspace or via a custom shortcut. This section expands on "Basic note entry" (see above) and introduces you to the full range of commands available for entering notes or rests from the computer keyboard. You can enter a note by typing the corresponding letter on your keyboard. Thus, after entering Note Input mode, type: 5 C D E F G A B C.
To enter a rest, type "0" (zero). Thus, after entering Note Input mode, type: 5 C D 0 E.
For example, after entering Note Input mode, type: 5 . C 4 D E F G A. If you want to enter a tuplet (such as a triplet): see Tuplets. If you want to write music with two or more simultaneous lines of independent melody (i.e. polyphony): see Voices. Insert extra measures into the score. Cut and paste a section of the score forward, then enter music into the gap. To insert a note, press Ctrl + Shift (Mac: ⌘ + Shift) + the note name (A to G). This will insert a note of the selected duration and move the rest of the notes to the right in the same measure. If the measure exceeds the duration of the time signature, the blue plus will appear above the measure as in Insert Mode. Select the note and press Delete. Press Esc to ensure that you are in Normal mode. Press Shift and click on a note to select the chord. The delete command can also be applied to a range of notes/chords. Shift+Q: Decrease duration by a dot (for example, a dotted quarter note/crotchet becomes a quarter note/crotchet and a quarter note/crotchet becomes a dotted eighth note/quaver). Shift+W: Increase duration by a dot (for example an eighth note/quaver becomes a dotted eighth note/quaver and a dotted eighth note/quaver becomes a quarter note/crotchet). Note: The default method of entry, Step-time allows you to enter one note at a time. Other note input modes are also available: see Note input modes. From the menu, select Edit→Preferences... (Mac: MuseScore→Preferences...). Click on the I/O tab and select your device under the section labeled "MIDI input". Click OK to exit. You will need to restart MuseScore to apply the change. Insert: (Called "Timewise" until version 3.0.2) Insert and delete notes and rests within measures, automatically shifting subsequent music forwards or backwards. By default, the small size is 70% of the normal size. You can change that setting in Format → Style…→Sizes. Type a new note letter name (A…G). Use Ctrl+↓ or Ctrl+↑ to correct the octave, if necessary (Mac: Cmd+↓ or Cmd+↑). This will automatically turn on note input mode.